UNIVERSITY PARK — With Tuesday’s release of pre-match notes for Penn State’s home duals against Army West Point (Thursday) and Bucknell (Sunday), some clues can be found about the competition at certain weights. At 125, three names are listed as potential starters: freshman Devin Schnupp (from Warwick High School), freshman Justin Lopez (from Yonkers, New York) and junior Kenny Yanovich (from Pleasant Valley High School). The trio is listed in that order. Is that an additional clue? We’ll see. Corey Keener and Jered Cortez are listed as the only starters at 133 and 141, respectively. And, in what could be an unexpected battle, three potential starters are listed at 197, in order: fourth-ranked senior Matt McCutcheon, sophomore Anthony Cassar and junior Shakur Rasheed. National online and television media made a big deal out of the goofing around Nittany Lion wrestlers engaged in before practices, matches and tournaments last year. And coach Cael Sanderson furthered that talk with his repeated references to having fun. Sanderson said during Media Day that he thinks more teams should embrace that attitude. “I guess I don’t understand why people don’t enjoy wrestling more. I love wrestling. I love the sport. I love what it takes to be successful. I think our kids love that, too. You get what you focus on. It’s just that mentality you have,” he said. And that attitude, defending 184-pound champion Bo Nickal said, starts with the coaches. “When you look at Penn State, what we have going here is really special. It’s special and it’s different from any other program, ever. You can look back to the beginning of NCAA wrestling. I don’t think there’s ever been a program like ours,” he said. “I feel really blessed to be a part of it. You can see how we interact with each other, the way that we wrestle out on the mat and the way that we support one another, it’s a different type of thing. We’re all pretty unique individuals. Some fans might wonder what motivation two-time NCAA champion Zain Retherford might have left in college wrestling. He has a 63-match winning streak (he hasn’t lost since the NCAA tournament in 2014), last season he won the Hodge Trophy, which signifies the best collegiate wrestler, and he’s already made a U.S National Freestyle Team. Retherford said in an interview prior to media day that his goal is to pin every opponent he wrestles. And he’s not the only Nittany Lion with that goal. So, too, does returning 157-pound champion Jason Nolf. Does Suriano’s departure hurt title hopes? When Nick Suriano decided to transfer from Penn State to Rutgers, many fans and media members thought that might have made the Nittany Lions vulnerable in their quest for a third consecutive title and their seventh in eight years. Despite what many might think, the Nittany Lions don’t seem mad at their former teammate. And they also don’t seem to think his departure hurts their title hopes. “We have plenty of guys in this room who can compete really hard. With Nick leaving we’re just putting the next guy in. It’s not really like a big deal to us. Nick’s a fantastic wrestler. He’s very good and he’s going to do really well, but we’re not really too focused on that. It’s next man up. We’re ready to go,” defending 165-pound champion Vincenzo Joseph said. Defending 174-pound champion Mark Hall shared similar sentiments. 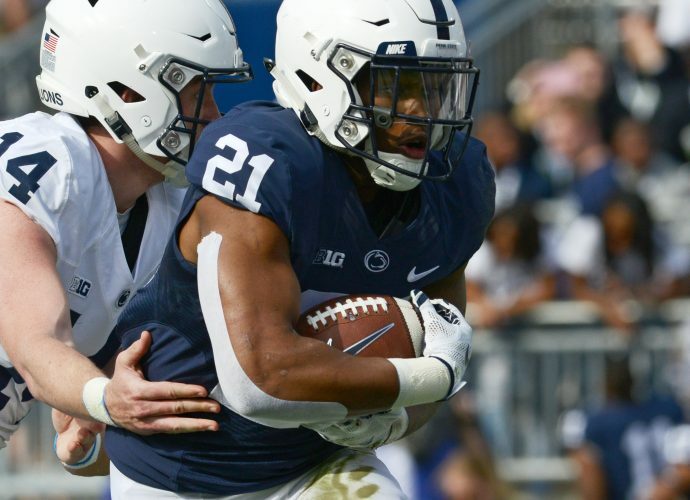 Retherford said neither he nor many of his teammates have spent much time handicapping who might be the biggest threat to Penn State. Nickal admitted that he thinks it’s good to be aware of your competition. He then went a step further in his evaluation of what people think the impact of Suriano leaving might mean.